Walmart will stop selling Confederate flag merchandise. Walmart Stops Selling Confederate Flag Products. But Mississippi’s Flag Is Still for Sale. Walmart ends sales of Confederate flag-themed merchandise. 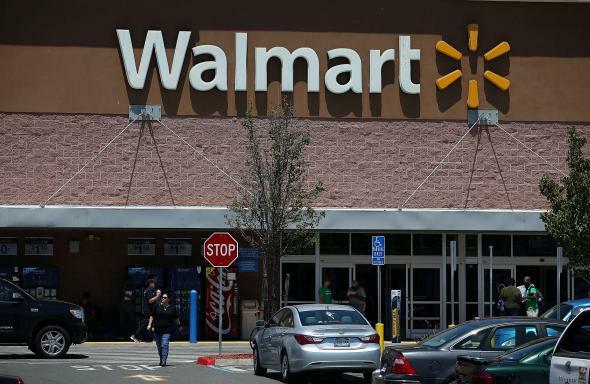 Walmart, the U.S.’s largest retailer, announced on Monday it will stop selling Confederate flag merchandise and remove items carrying the flag from its shelves. The announcement comes shortly after South Carolina Governor Nikki Haley called on Monday for the removal of the Confederate flag flying outside the South Carolina statehouse. The racially motivated mass murder by Dylann Roof at Emanuel AME Church has renewed calls for the state to take down the Civil War era flag. A quick search on Walmart.com shows the site has already been scrubbed pretty clean of any Confederate flag-inspired memorabilia. And previously there was plenty to choose from. 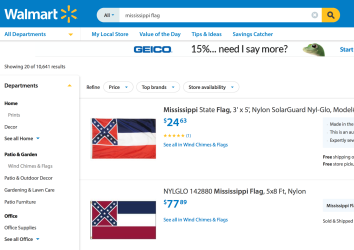 The one Confederate-themed holdout at Walmart—so far at least—appears to be the Mississippi state flag, which incorporates the Civil War-era imagery and remains for sale at Walmart.com. Walmart’s Mississippi state flag options. On Monday, Republican Mississippi House Speaker Philip Gunn called for the removal of the Confederate flag portion of the state flag.